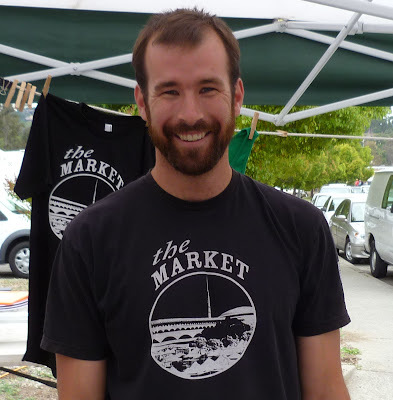 The Marin farmers market is one of our favorite Sunday destinations. We have been going for years and are on first name basis with some of the venders. Summer produce is in and the market is very colorful. I would like to share a couple of images with you. 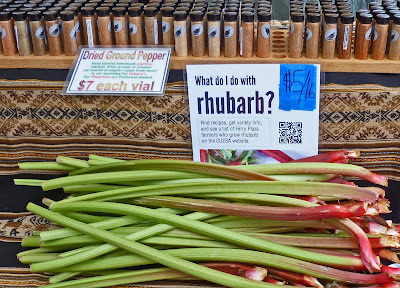 I have always wondered what to do with rhubarb. t-shirt to represent the Marin Farmers Market. We hope to see you there next Sunday! We bought one of those melons. OMG! Sweet to the max. It is one of the best markets in this area, no doubt about it. Colorful, varied and even features artists and craftspeople, too. What time you goin'? Greg, I love big ripe and juicy melons if you know what I mean. Zoomie, It is one of the best for sure. We usually get there at 800 am because that is when Cranky and the Mad One are hunkered down at the coffee booth. That does not always happen because of hair issues and barbeque contests. It is best to arrange a meeting. Shall we all meet Sunday at eight? Greg too. I'm working on my hair. Problematic, but I will go if you do. I love that T-shirt. Getting one! cookiecrumb, That sounds great but we will be up at Clear Lake eating some of the best barbeque in the nation. I wish I had my bow tie to wear with my judges uniform. I do not have a Marin t-shirt yet, but I could be the "Waiter from Marin Judge". Here comes the Judge! Clear Lake? Are you kidding? Where in Clear Lake do you find good barbecue? When I was there, it was hard to find anything edible, much less good. Xoomie, Please do not be angry. You were just there at the wrong time. This weekend, will be a contest at Konicti Vista, that will bring all the big guns from the West Coast. This is a great show for the Public. One to Two dollars will give you a taste of award winning barbeque. You can then vote on the 'Peoples Choice' Award. We hope you can make it. OK, let's look forward to another weekend soon. I have pears to give away, so let's not delay. Have fun, Chilebrown. 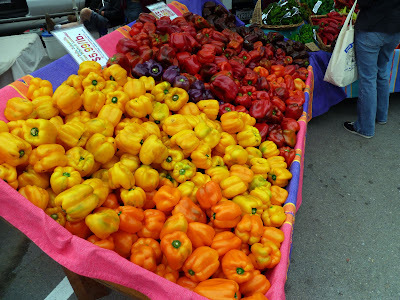 I love looking at Farmer's Market photos! So how about loser has to mail their favorite rub ... sounds appropriate since the Raiders have always rubbed me the wrong way. Chilebrown, not angry, just incredulous. But now I understand - just the wrong weekend. Can't come this weekend - we have house guests. Maybe next year.